Where to start! Well I am confident that every author, blogger, and person in attendance will post their own versions so I’m hoping readers and everyone who missed out will get an overall feel of the convention from several different sources. Here is my experience. I flew in Thursday morning and checked in with registration (and my awesome roomie Gryvon!) easily and dumped my things in the hotel. A side note on the hotel – NOT recommended. But rooming with easy going and cheerful people, Gryvon and Ann Anderson, made it much more pleasurable. Plus the conference will be at a different hotel next year. I checked the restaurant in the hotel but it didn’t really have any options for me so I walked down the street to Panera. It did me good to stretch my legs anyway but I remember thinking “oh god I should just go home, I don’t know anyone here!” SMP was nice enough to invite me, Grayvon and Ann were great roommates, and I met another reviewer Lisa but everyone had people to hang out with and were busy. Thankfully I had panels! 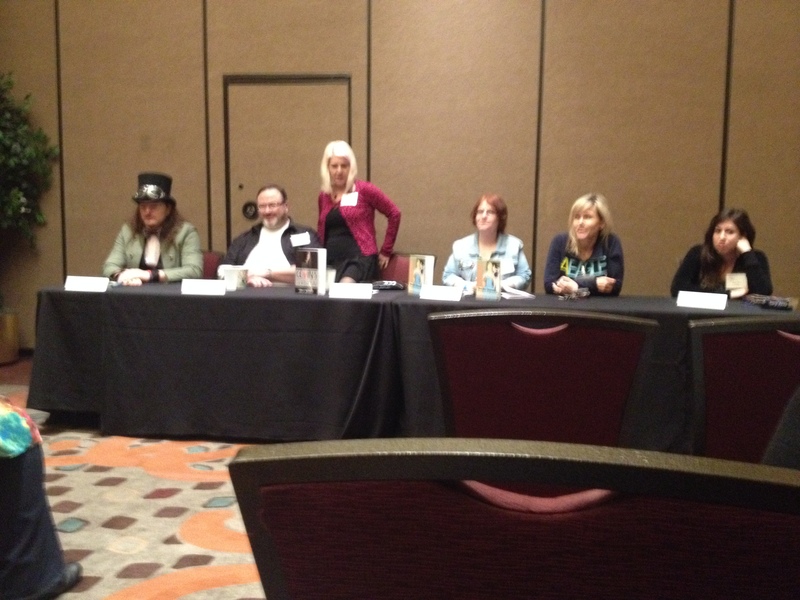 I’ll post on another post about the panels I was on – five in all! – but the overall structure of the convention and cerebral aspect of the entire weekend is what saved me. Well that, and the fact that I actually met my soulmate, Caethes Faron, and she introduced me to other authors and readers. I was surprised at how open and friendly almost everyone was. For me the conference differed and exceeded GRL in two extremely important ways. First Rainbow Con was in essence – a convention. It wasn’t really a fan based weekend but that certainly played into it. There was more than enough time to hang out and chat with your favorite authors but there was also significant structure to the weekend where if you didn’t know too many people or actually wanted to talk books you could do so with ease. Breaking down those two rather large differences I’ll start with the panels. There were so many panels and almost every single one of them sounded interesting. There was an author track and a reader track but certainly you could mix and mingle as you wished. I found several of the author driven panels to be fascinating and I participated in several of the reader panels myself while attending many others. The panel topics were interesting – even if the titles were occasionally vague and obtuse – and the resulting discussion between audience members and panelists kept things very lively for every panel I attended or participated in. Character playing cards from Geoffrey Knight! 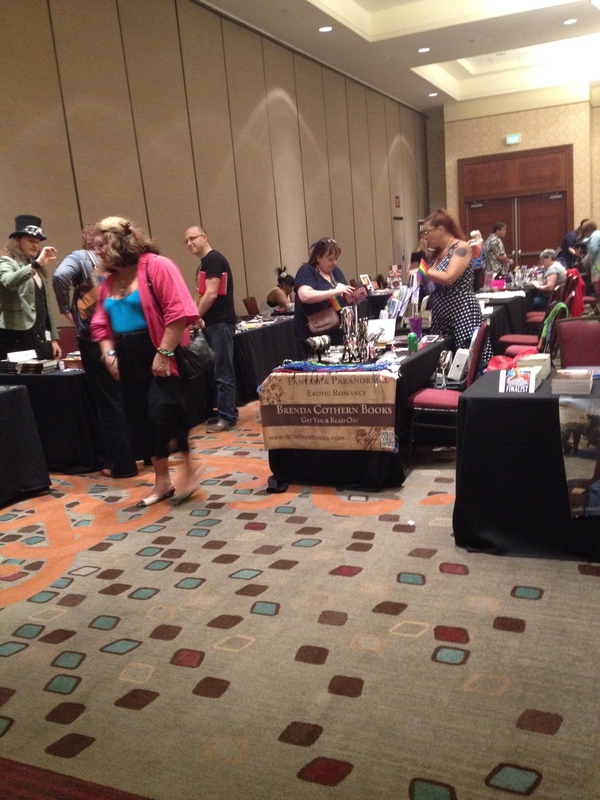 Kindle Alexander swag table – condoms and lube! Additionally there was something scheduled everyday from 10am to 10pm with breaks for lunch and dinner. If you were a lone author or reader going to a convention where you may not know many people, this organization helped give attendees something to do but there was also no requirement to go to everything. In fact I missed several of the late night events – though they looked amazingly fun! And occasionally I’d miss panels I wanted to go to because I was caught up talking with people. Something I honestly –never- thought would happen there. There were so many interesting and thought provoking panels that often they were scheduled at the same time and I had to choose between two talks I wanted to see. I’ve heard that next year they’re thinking of recording the audio from the panels to make it available in such situations. I really hope that’s true because even know I’d love to know how certain panels went. 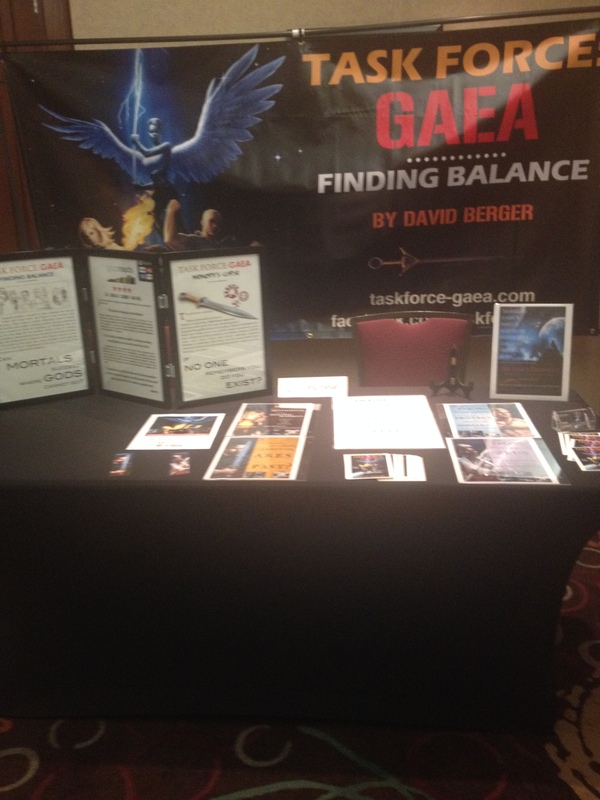 David Berger swag table. Totally caught my eye. I realize that conventions are a subjective experience, just like anything else in life. I personally appreciate an intellectual and content driven convention more than just a socializing gathering. Readings are ok but I dislike them generally and they never really interest me in a new author. Instead I want to hear the author’s thoughts on writing, their subject matter, and what excites them in the field. That more than anything will get me to buy their book. So I appreciated that the focus was again on content and subjects relevant to the diversity of the genre as a whole and not simply “meet the author who doesn’t really have time to talk.” Our community is relatively small and somewhat incestuous so it’s nice to have time to speak with authors about the topics that affect the field and reflect current trends. I’ll talk more about my specific panels – which I really quite enjoyed being a part of – in another post since this one is so long. I’d urge people to consider Rainbow Con next year as I think it’s a phenomenal way to interact with other people passionate about this genre and curious about the industry in general. The wide range of intellectual conversation should suit readers, reviewers, authors, and publishers. And of course there is social interaction, plus jello shots! Strippers on the first night! It sounds a lot like the UK Meet with panels and I never felt lost in the crowd. The chatting with authors thing was easy and authors were always happy to get to know everyone. It’s really more my speed. I liked that there are some social things in the evening but that there is more structure. Just my cup of tea, both have their upsides and downsides depending on your situation/preferences. Looking forward to hearing about the panels. Tam, I had the same idea when reading Kassa’s post. Sounds like you had a great time Kassa, I am curious about the panels. I did! Hopefully I can convince more people to come next year. I’ll be posting about the panels in a few days. So much to write about! That’s exactly how I felt at GRL. I had a great time, because I was with all you guys. If I had been alone, I think I would have floundered some. New Orleans is a great city and I can always entertain myself by myself there but otherwise, not so much. I remember showing up at the conference hotel and thinking there wasn’t much to do at all and wandering away. Your comment does make me think the UK meet would be awesome and I may try to make that a priority. I do like the structure and it suits my particular conference needs and desires. I also thought about the UK Meet when reading this post; I went knowing no-one in person, a few on-line, and wanting to hear from several authors. Because of the structure it was easy to be busy, and because everyone was very friendly it was also easy to get to know people. The panels were interesting, and there was the right mix of things to do and time to socialise or rest. So I’m going again this year and I do recommend it, especially if you’re on your own. Thanks! I keep hearing really wonderful things about the UK meet and it seems like the structure would really suit me. When is this year? It’s coming up soon already, 7-8th June in Bristol. I agree with you and Tam about GRL! It was definitely the time we spent together that made the experience memorable, not so much the program of GRL itself. We had such a wonderful time! I miss you guys! -sob- It’s really a selfish ploy to see you all again :D. But I do think the content at Rainbow Con would have pleased most people. Rather than just being one big party. Kassa House, you were a highlight of the trip for me. And I agree with like at least 50% of this post. Okay 45%. Kidding, I thought you summed up the conference very well. I’m ready to see what you thought about the panels. <3! Yes! I enjoyed talking to you. I’m glad someone else thought that panel was interesting but I was surprised to hear the word “emotional” used by so many reviewers. I no doubt fall too far on the analytical but I think the best review is a combination of both. Here’s to hoping a few more help balance it out! Kassa, I’m just now scrolling through some of your posts and found this one. I loved meeting you, even if we only got a short time to talk. You’re clear-spoken, intelligent, and able to convey your thoughts in a gracious and courteous manner. You made quite an impression on me, and I’m glad I’ll get a chance to meet you again at next year’s con.